This is a One Bedroom Large Condo with an open concept floor plan which is larger than the standard 1 Bedroom Condos at Jetty East. LARGE 1 BEDROOM/1 BATH UNIT ON THE 2ND FLOOR, MAX OCCUPANCY IS 4. This is a perfect unit when a typical 1 bedroom is not enough but a 2 bedroom is too much!!! • Almost 200 square feet larger than regular 1 bedroom units. • New living room and dining room furniture and new bedroom carpet and the entire unit painted in August of 2014. • Large balcony, over twice as large as regular 1 bedroom units, with breathtaking views of the East Pass, Lake Christina and a slice of the Gulf. Your family will enjoy this extra-large one bedroom unit with an expansive living area and fully equipped kitchen that's even large enough to cook for the holidays! The massive island is perfect for entertaining or meal prep. On the other hand, you can enjoy those special and more intimate meals around the custom dining table for six, or out at the patio table, while you enjoy the million dollar views from this spacious balcony. Not only does it have those amazing sunsets, but you can view the fireworks in the summer and the entertaining air shows. Since this unit extends further out than other Jetty view units do, your view is unobstructed by other bays of the building. 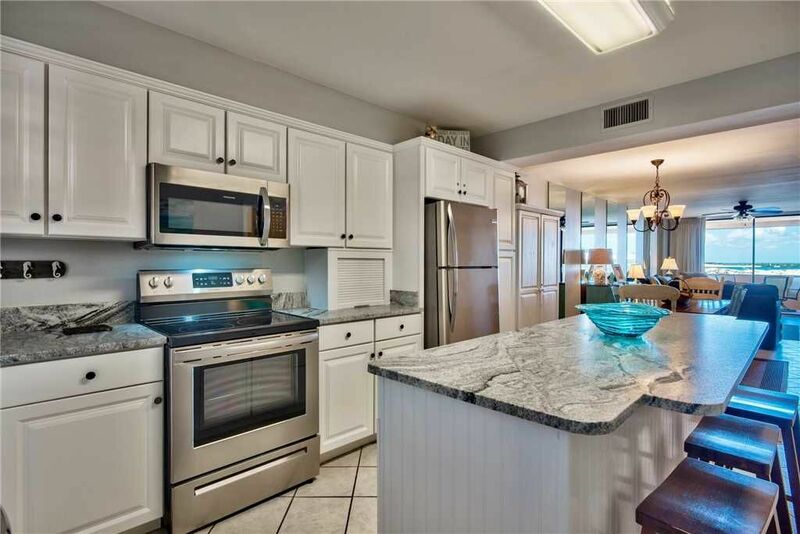 With a shabby chic beach style and open floor plan, you'll never want to leave the condo! It's conveniently located only a few steps away from the elevator, and the middle staircase for a quick jaunt down when the beach can't wait for the elevator! It is also conveniently located to the linen exchange! Enjoy the 48 inch LED TV with Blu-Ray player in the living room while sitting on the comfy La-Z-Boy furniture. After a long day on the beach, retreat to the gorgeous bedroom featuring a comfortable king size bed, a 32 inch TV and DVD player. Enjoy dimmer lighting in the bedroom, den and dining area; ceiling fans in the bedroom and den and USB charging receptacles for charging of your electronics in the kitchen and bedroom. For those longer stays, you will find that this unit has tons of storage space in the living area and the bedroom. While some units have moved to strictly showers, this unit still offers a tub/shower combination....because we know guests like to soak after a day at the beach. This unique and popular unit books fast, so make your reservation now, to experience all that this Large One Bedroom unit has to offer!!! A very clean, updated and nice unit to spend a few days. My wife and I were very pleased. It is always wonderful to hear positive feedback from a guest that chose to spend their vacation time at your property, hopefully this will encourage others to come stay with us and enjoy all the amazing features that Jetty East Condos, Destin, FL and the Gulf Coast have to offer! Perfect lil spot for hubby, me and middle daughter for a quick trip to Destin. Loved the balcony, the view of the jetty, ocean and lake. It was great!